No getting around it, Todd Redmond & Co of the Braves did a better job that our Richard De Los Santos. Not that we didn’t do OK, but it wasn’t good enough. It could have been worse, but several very nice plays kept us in the game. In the first inning Fernando Perez lost a ball in the sun, but the next batter hit on just wide of the pitcher’s mound. In a very nifty play, De Los Santos fielded the ball and threw out the runner going from second to third. That same inning was wrapped up by a clean bases-loaded Furmaniak - Dillon - Richard double play. Quick thinking in the 3rd kept a runner off second. The Braves’ Matt Young, on first, stumbled on his way to second. Second baseman Joe Dillon, who seemed to have only a play at first base, instead went to second and got the lead runner. In the 5th third baseman Angel Chavez made a nifty bare-handed grab-and-throw for the second out, followed by a nice sliding catch by left fielder Dan Johnson. In the 8th a grounder ricochetted off pitcher Mike Ekstrom, but Chavez gobbled it up and made the out. That’s the good stuff. Now for the cranky old man stuff. Jose Lobaton looked at three pitches and made three outs. In two of those runners were on base. For a guy who was doing OK with his On Base Percentage (see below) that was terrible. I took a look at the Montgomery Biscuits stats. They don’t have an outfielder who is having a great year, but several, including Rashad Eldridge, are having better years than Fernando Perez. I really like Perez, but things do not seem to be getting better. 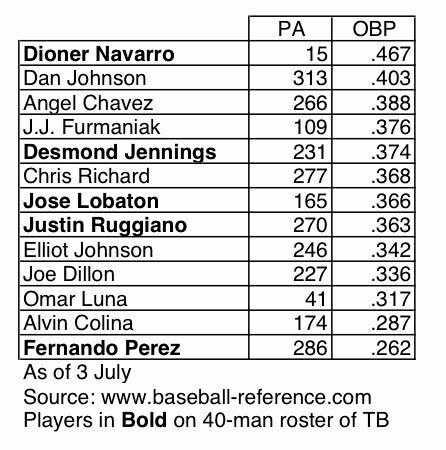 Thought there might be some interest in isolating out OBP for the Bulls position players. PA is “Plate Appearance”. 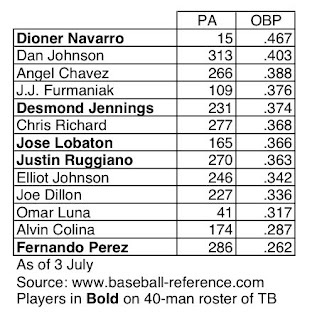 Navarro's numbers will drop after he's been here a while. I hadn’t realized how well Angel Chavez was doing at getting on base, or how poorly Alvin Colina was. It’s really going to hurt when Dan Johnson goes somewhere else, but you have to think that he isn’t long for the Bulls. He’s just having too good a year not to be noticed.